To gain trade points you need to buy goods in one city and sell it to another and earn a profit, for each 20 goods sold at profit, you gain 1 trade skill point. First you need to earn a lot of gold, fast trading cost gold, five million or more is a good start. Next thing you need, before starting to trade, is get some Merchants or preferably Spanish galleons, both ship types have many cargo rooms, you can build them in the shipyard. Learn all about ship building here. When you got gold and ships, you are ready to trade, you then need to find two cities close to each other, where one got low buy price and the other got high sell price, of the same type of goods. 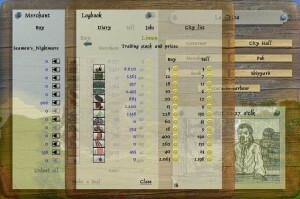 To find a city with high sell prices, you need to find a lack of goods, you can see when or if a city has lack, in the city news under city hall, unless a player has filled news with sinking or fencing ships. You can also look at deliver goods jobs, by taking a job that says deliver goods, to the city you intend to trade at. When you take the job, you can see what goods the city needs, by going into the merchant at the city you are at. Here there will be red numbers if you do not have the goods or green numbers if you have the goods, the city got lack of. You do not want to complete the job, if you want many trade points, so delete the job again. It is then a good idea, to go check the prices at the city you found out has lack. When you found a city with lack or that just had lack so prices still high, you then look at nearest city and what prices it got. You can compare prices easily by going into the merchant in the city, then use the right click menu and look under logs/cities and press city list, find the city you just where at, click it and press the barrels. If you chose a high transparent in options, you will be able to see both the prices at the city you are at and the prices of the other city. Remember you can only see buy prices, unless you press sell, to see sell prices at the city you are at. Here is a list of the lowest buy prices possible, the city you intend to buy at, should have a buy price close to this or as low as this. Now you found your two cities and are ready to start trading. You start out at the city with low buy price, of the goods you intend to trade with. First, always sell your cargo hold of the type of goods, you are going to trade with and then follow these easy steps. Step 1: You buy all the goods you can have in your cargo hold, remember to always have food with you, so your crew, do not commit mutiny. 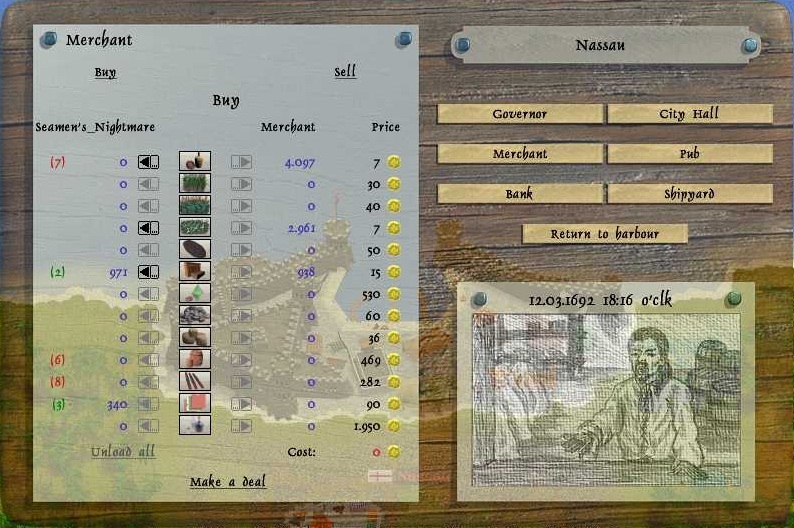 Step 2: Sail to the other city, sell all the goods at high price, to gain trade points. Step 3: Buy all the goods back you just sold. 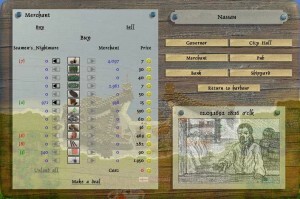 Step 4: Sail back to the first city and sell the goods at low price, here you will not gain trade points. Step 5: Repeat all the steps, as long you can keep earning a profit and gaining trade points at one city. Note that cities add and remove goods periodically, so if there still is a lack and you have sold your goods and not yet rebought them, the city can take some of your goods and you can end up having no more goods to trade with or the city might lower its prices on that type of goods fast. So can be a good idea to wait till right after the city added or removed goods, before selling and rebuying goods at the city you gain skill points at.